Not long ago, Apple® began to position the iPad Pro® as “your next computer” for those considering the many options in the notebook environment. With its continued technology advancements and the addition of a keyboard and pencil, the iPad Pro was blurring the lines between tablet and the more conventional mobile computer. Now Apple has taken that distinction even further with the new iPad Pro, recently introduced at a special event at the Brooklyn Academy of Music. 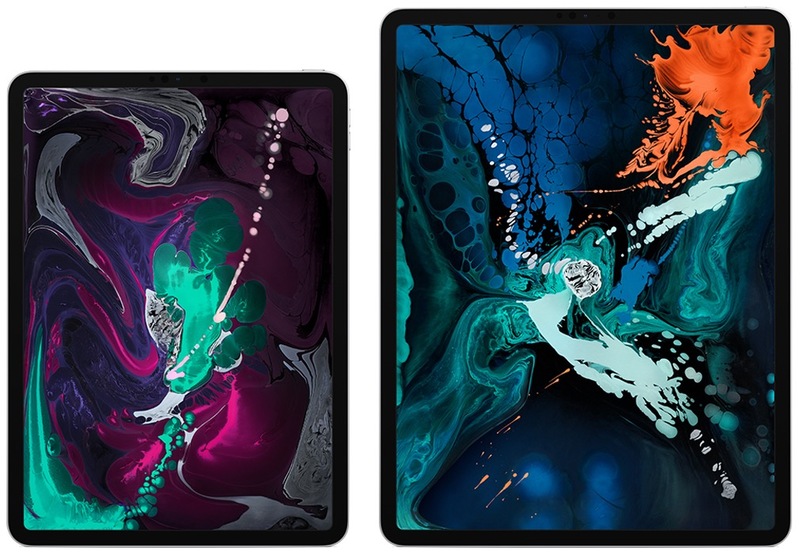 The new 11-inch and 12.9-inch devices — the thinnest iPad Pro models ever — have been reengineered with Apple’s most innovative technologies and feature an advanced all-screen design, an enhanced Smart Keyboard™ Folio and a redesigned Apple Pencil® that is more capable than ever. Let’s start with the new edge-to-edge Liquid Retina® display. Using a process called subpixel anti-aliasing, Apple rounded the corners by tuning individual pixels for smooth, distortion-free edges and true-to-life color from one rounded corner to the next. Add to this the lowest reflectivity in the industry and you have an iPad Pro display that is clear and readable wherever you go in whatever light source you have available. Eliminating the Home button found on previous models has enabled Apple to increase these display sizes. The 11-inch Pro now offers a larger display in roughly the same form factor as the older 10.5-inch model. With the 12.9-inch Pro, the display size remains the same as before but the height of the casing has been reduced. The result is a paper-sheet sized device that is incredibly lightweight. Like the iPhone® X series, the new iPad Pro models drop Touch ID® in favor of Face ID® authentication. The unique-to-iPad 7-megapixel TrueDepth® camera on the front of the iPad Pro that makes Face ID possible also enables support for Portrait mode, Portrait lighting, Selfie Scenes in Clips, Animoji® and Memoji in Messages and Group FaceTime. Also dropped is the Lightning® connector in favor of the industry-standard USB-C for charging and connecting to peripherals … as well as the headphone jack, now gone for good. Performance enhancements have also targeted notebook computing standards. 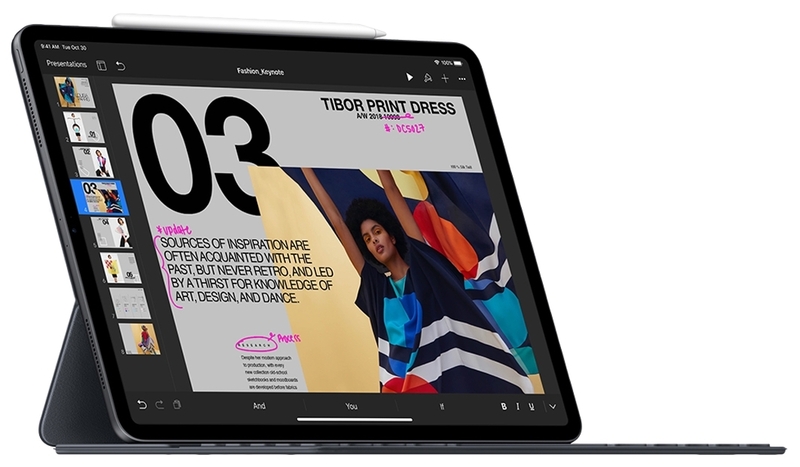 The Apple-designed A12X Bionic chip has an embedded M12 coprocessor and Neural Engine to give the iPad Pro unparalleled performance among iOS devices and performance faster than 95% of notebooks available today. Wow. The performance boost also improves the 12-megapixel rear camera, enabling enhanced computational photography capabilities, like Smart HDR, which takes multiple images and intelligently combines them for the best possible exposure. The two must-have accessories for the iPad Pro have also been upgraded. The new Smart Keyboard Folio attaches magnetically to the back of the device to provide protection. It delivers data and is powered through the Smart Connector without batteries or charging. Opening the front cover automatically wakes your iPad Pro and, now with two viewing angles, you can watch or work in whatever config is best for you. The new Apple Pencil now features a flat touch-sensitive surface that users can double-tap to change drawing modes in many apps. The flat surface also makes it easy to magnetically attach to the edge of the iPad Pro, preventing loss and keeping it charged. The new Apple Pencil is also shorter and more pencil-like so it won’t roll off desktops anymore. If you are using an iPad Pro as your primary work device, these compelling enhancements (at higher costs) may just make sense. Both new models and accessories are available now, so check apple.com for a roster of configurations. And, as always, check with CranstonIT at 888-813-5558 or support@cranstonit.com before upgrading to any new product or OS in the Apple ecosystem.